“Gettin’ lucky” – implications for ventures on the frontiers. Venturing on the Frontiers – A simple guide. I wrote about the gist of this image here. Now I’m turning to the implications for venturers. Quite simply the essence of venturing is a process. A process of creating spaces for things to happen (some call it ‘luck’). The simpler and more accessible the space, the easier it is to get people engaged and get things done (some would say ‘the luckier you get’). Sound simple? It should be, but can you simply articulate the 3 primary spaces for your venture? Do you have a time and place to think about and evolve those spaces? Why are people connecting to you? Do they know what they need to meaningfully contribute in ways you may not have asked or may not be expecting? How often have you been ‘lucky’? So how can ventures get better at “gettin’ lucky” on the frontiers? Revisit planning as a team – those who control the resources and those who do the work. In the context of your spaces, figure out what your going to do for the next meaningful chunk of time, making the most of what you have, and getting what you need to move you most towards fullfilling your purpose. Make connections throughout your spaces to better understand and define your spaces, and to get done what you need to get done. Do it with purpose and give it space to let something happen. Take a look at what you did for steps 1-3 and do it again – but better. This becomes the process of venturing. Find what works for you and your venture. There is no right way. There is no right answer. In fact, there really are no answers… just keep asking questions, keep moving forward, and keep at the process. You can’t know where exactly you’ll end up but you’ve got a much better chance of “gettin’ lucky”! Posted on February 12, 2008 Categories UncategorizedTags frontiers, process, venturing1 Comment on “Gettin’ lucky” – implications for ventures on the frontiers. Venturing on the frontiers is about the early stages of taking on big challenges. It’s a space where conventional models to planning and management prove ineffective. It’s the place where entrepeneurs trust their ‘gut’ and face the challenges with an unrelenting push forward. And it’s the place from which the greatest change can come about. 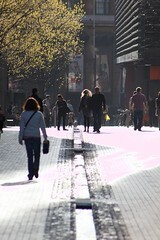 I’ve published the image under a creative commons license so please feel free to use and build from it accordingly. And as always, this is but a snapshot of understanding and bound to evolve… so please do get in touch with your reflections, experiences, and suggestions. I’ll publish future posts on the implications for ventures and venture investors who are pushing the frontiers. Don’t expect magic bullets, but rather a prompting of some productive questions. If anything this has reminded me is that there are no answers, only questions… and asking the right ones can make all the difference. 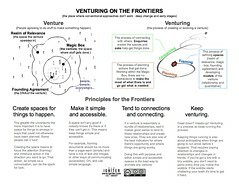 Posted on February 11, 2008 Categories UncategorizedTags frontiers, model, principles, venture, venturing, vfi1Leave a comment on Venturing on the Frontiers – A simple guide. The definitive definitions of venturing! One of the surprising things that I came out of my latest exploration into the frontiers of venturing and venture investing is a set of definitions. I’m actually not one that likes to debate definitions ad infinitum but I found I needed to clarify things to be able to have meaningful conversations going forward. So here, is what I’ve come up with… for now (I’ll keep updating this definitions as the evolve so feel free to check-back or link here for reference). Venture: An agreement among people to do things in service of a purpose and according to a set of values. Venturing: The process of creating and evolving a venture. Venturer: A person primarily involved in or responsible for venturing. Operator: A person primarily involved in or responsible for operating a venture. Entrepreneur: A venturer that also carries primary responsibility for operating a venture. Frontiers of venturing: The effective limit of conventional approaches to venturing. Frontiers of venture investing: Investing in ventures that are on the frontiers. Posted on January 21, 2008 Categories UncategorizedTags definition, frontiers, venture, venturer, venturingLeave a comment on The definitive definitions of venturing! Giddy-up: getting better on the frontier. Coming out of this first inquiry I’m left with new definitions for venture, venturing, and venturer and also a simplistic grouping that the process of venturing essentially requires agreement, action, and governance. It is important to note that these are a set of observations and interpretations that will continue to be evolved in practice. As such they represent a starting point for a concerted effort to ‘get better at venturing and investing on the frontiers’. Venturer: A person primarily involved in venturing. the process of productive, iterative exploration (PIE). These items become the core components of a ‘venture profile’ which is an articulation of the collective agreement on what the venture is. any other explicit responsibilities and expectations. Collectively, the bundle of individual relationships along with each associated agreement form the essence of the collective agreement articulated in the venture profile and could be visualized through multidimensional maps which naturally will evolve as does the collection of individual relationships. Here there is a significant opportunity for new and improved practices in venturing. The collection of individual agreements also forms the basis for financial model. This is not the same as financial projections which are often an exercise in justifying an anticipated outcome but rather they are the basis for being meaningfully able to anticipate the results of the existing and anticipated agreements under certain conditions. With the core profile in place we move into the activity of the venture itself which is best determined by those that have the authority to complete the action being determined. This follows from observations in systems science that planning only happens when action is the result and so can only be carried out by those with the authority to act. The most effective planning approaches will be recognized as intentional, co-creative, and iterative action planning. Established approaches from community and software development could be well applied here. For example, the methodology from the Institute for Cultural Affairs Technology of Participation are particularly effective when conducted with short time horizons (e.g. monthly and/or quarterly) within the context of the venture profile which itself is reviewed periodically (e.g. annually with the inclusion of strategic direction planning). Similarly the agile development process is particularly relevant for venturing on the frontiers. Governance of a venture (collective agreement and the action that unfolds from it) is best fulfilled through attention on the cohesion of the venture and on signals of incipient instability. Going back to the definition of a venture, this is about monitoring the changing trends in relationship status and agreements. This is perhaps the most unique discovery in these conversations. Changes in the tone of relationships is often one of the biggest and most consistent indicators of incipient instability. This by no means implies that relationships should remain static or that relationships should not be allowed to decline, that’s simply a part of evolution. What it does imply is that changes in the trends of relationships status are particularly powerful indicators of change including growth and incipient instability. For example what’s often described as ‘momentum’ is an upward trend in the strengthening and addition of relationships. Or a founder of an organization challenging the direction the venture is taking may be an indicator of a change in the collective agreement, particularly if it was well articulated at the outset (which is rarely the case). Of course, monitoring financial metrics and changes in budget/plans can also signal incipient instability and by no means should be excluded. Rather disciplined attention should be focused on the metrics that indicate potential instability. If the management system is attentive to incipient instability it will be able to minimize its effects or avoid it all together. The other dynamic of effective governance is attention to the cohesion of the venture itself. This means that ensuring that both PIE and CV are being attended to and that the dynamic between them is constructive. governance attentive to cohesion and able to anticipate and preempt incipient instability (future indicating metrics, report card, ability to respond constructively). Practically, there is significant opportunity in improving upon each of these areas and particularly in the area of relationships with the emergence of new ways and styles of connecting brought forth by virtual communications developments such as social networking technologies. And with that now begins the process of putting this into practice and an open invitation to those who want to embark on this with me. Posted on January 7, 2008 Categories UncategorizedTags cohesion, frontiers, governance, process, purpose, values, venturing, vfi1, viabilityLeave a comment on Giddy-up: getting better on the frontier. A little over a year-ago I began considering what’s next in my journey and exactly 3 months ago I initiated my first inquiry into what’s needed on the frontiers of venturing and venture investing. It hasn’t been a linear journey of course, with a good deal of my attention going towards getting Causeway going over the last year. While that was ongoing, I had about a dozen conversations over November and December with some extraordinary social venture investors and funds in North America (including Renewal Partners, Social Capital Partners, Kellogg Foundation, RSF Social Finance, Good Capital and others). To all of you I am tremendously grateful for the generosity of your time, the candor with which you shared your experiences and the enthusiasm with which you’ve approached this exploration. Each conversation integrated into my own experiences and readings, and into every other conversation. What has emerged for me is a point of summary from which I feel ready to attempt some active experiments into how do we get better on the frontiers as venturers and venture investors. Seed venturing toward systemic interventions – deal funnel: screening, conditions, and structuring. Seeding ventures focussed on systemic interventions needs to be come at with an approach that is grounded in systems thinking. Conventional wisdom in venture investment has come from theory and experiences often based in working with business systems that are working within and dependent on the current system itself. What I’ve found is that the earlier the stage of investment and the more oriented the venture is toward a systemic intervention the more ‘gut instinct’ is used a guide to making investment decisions and supporting the growth and success of those ventures. My thoughts have been going toward what would something that focuses on seed venturing toward systemic intervention look like and how would it work. What I’ll be posting on for a few posts is going to be my emerging ideas in this. First off… what would be the filter for projects that it would take on? What would the ‘deal funnel’ be? Is systemic intervention the goal of the venture? Are the readiness indicators favorable? Are the conditions for accelerated growth present or practically possible? A key intersection point is that a financial investment is a powerful catalytic moment in the emergence of a venture. That catalytic power can be most productively harnessed if it is focused on encouraging the conditions as opposed to ensuring rigorous controls are in place. It also hopefully leads to much simpler deal documentation that focuses on establishing and orienting the relationship that is being created and how this investment can be used to create the conditions that will most accelerate the growth of the venture… the intensification of the vortex. That felt good. Let’s see if makes any sense. Posted on July 11, 2007 Categories UncategorizedTags venturingLeave a comment on Seed venturing toward systemic interventions – deal funnel: screening, conditions, and structuring. Here are the latest presentations on the directions that are really interesting me right now. Take a look and send me any thoughts, comments, connections. It grows and gains momentum with the attention of others. Posted on March 13, 2007 Categories UncategorizedTags systemic change, venturingLeave a comment on My latest presentations. The U.K. and soon the U.S. are putting together some great new hybrid models that look to engage the power of the capital markets in ventures that are created strictly in community interest. Take a look here for a primer on the U.K. model and here for launch pad to some of the U.S. work. Seeing the evolution of markets is a wonderful thing. Posted on March 5, 2007 Categories UncategorizedTags social enterprise, venturingLeave a comment on For benefit/community interest corporations.